The building of St Barnabas, designed by Sir George Gilbert Scott, was supervised by George Dines, who had been the trusted general foreman of Thomas Cubitt. George Dines was born near HItchen, Hertfordshire, in 1812, but when he was three years old, his father Charles, head gamekeeper at Southill Park, the country home of Samuel Whitbread, was shot dead by poachers, one of whom was later hanged at Bedford. One of a large family deprived of their father at an early age, young George had to mature rapidly, determined to help his sisters to a secure future. At the age of 14 he was apprenticed to a carpenter and cabinet-maker, John Marks of Hitchen, the indenture being signed by George himself and his mother Mary Dines nee Lee. Through Thomas Cubitt’s friendship with the Whitbreads, George later joined Thomas Cubitt’s vast building firm which eventually covered 11 acres in Pimlico (called Thames Bank, where Dolphin Square is today). Through hard work he rose rapidly to become Thomas’s “youthful but trusted” general foreman, one of his projects being the extension and rebuilding of Osborne House for Queen Victoria on the Isle of Wight between 1845 and 1851. Aspects of his character are reflected in the story that one Sunday he received a message from the Queen requesting his immediate presence to discuss business. George replied that he would attend Her Majesty at any time of the day or night but not on a Sunday. The Queen did not chastise George for insolence, but instead made him a wealthy man. On another occasion when George met the Queen on the site, he removed his top hat and all his plans and papers, which he kept in it, fell at the Queen’s feet. After Thomas Cubitt died in 1855, George Dines took over as a builder and developer on his own account. George Cubitt, who had inherited great wealth from his father Thomas Cubitt, engaged Dines to deal with the practicalities of realising Gilbert Scott’s elaborate designs for his “scaled-down cathedral” of St Barnabas, Ranmore. It is understood that the whole project, with its wonderful variety of marbles and extraordinary decorative carving, took an amazingly brief 18 months. There is a brass memorial plaque to George Dines beneath one of the windows in the North Transept of the church, but it is difficult to find and even more difficult to read. However, it and the others in this area would have been much more prominent before the organ was moved to this position in 1954. It seems reasonable to conclude from the plaque’s wording that it was put up by George Cubitt in gratitude for a job well done in building his church and perhaps as a memorial to a good friend. At Windsor on 15th March 1862, Queen Victoria laid the foundation stone for Frogmore Mausoleum to house Prince Albert’s remains, with George Dines now Master Builder in charge of the project. The Royal Archives hold many fascinating letters from and referring to George about the progress of this work and that of remedial work on the adjacent Mausoleum for the Duchess of Kent (Victoria’s mother). Over the years, George Dines and his family lived variously at Windlesham, Cobham and Surbiton before in 1875, anticipating retirement, he built a large house on 4-5 acres at Hersham near Walton-on-Thames. 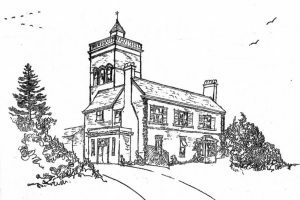 The house was called Burlea or Woodside, and a special feature was an Italianate tower, used by George and his son William for meteorological observations. 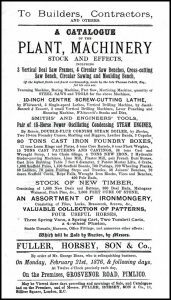 The following year, in 1876, George Dines gave up his business and sold its stock and effects. The sale catalogue showed how comprehensive his works were and how highly mechanised for the period, with steam playing a very important part. Having become well off in middle age, and with a long interest in meteorology, stimulated by his building works. George Dines wrote various articles for The Royal Meteorological Society on subjects such as the “Temperature of Dew-point”, the “Temperature of Hill and Valley” (comparing Denbies with Cobham), “Dew, Mist and Fog), and “The Significance of Fog Particles”. He was elected a Fellow of the Society in 1864 and continued his studies of these and other related subjects such as wind pressure until a few weeks before his death. 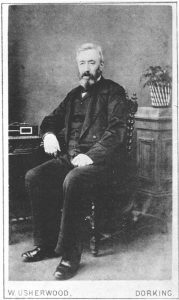 George Dines died on 25th May 1887 at his home in Hersham. He was buried at St Peter’s Hersham where in 1892 his widow Louisa Sarah nee Coke joined him. Most of their children had died young, but their only surviving son William Henry Dawes was also a notable meteorologist.